The Dockers won 77% of their games in the 2015 home and away season, 17 out of 22. So far in 2016, they’ve won just 3 out of 20, or 15%. Their winning percentage declined by 62 percentage points. 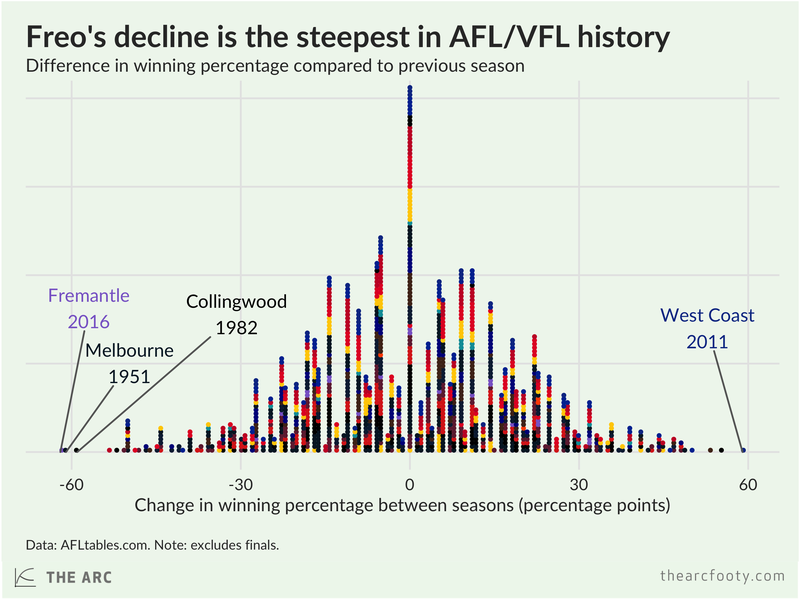 A season-on-season decline of 62 percentage points is not just large, it’s the biggest single season decline in the history of VFL/AFL football, from 1897 onwards. The only teams that came close are the 1951 Demons and 1982 Magpies, both of which also experienced declines of around 60 percentage points in a single season. 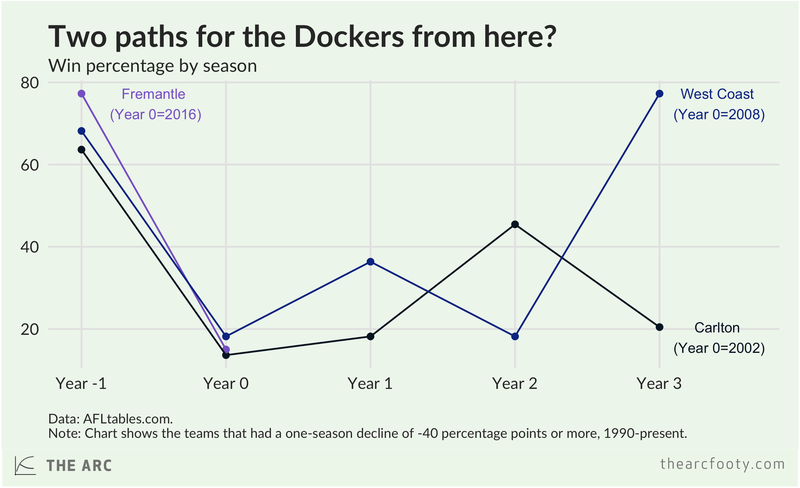 In the AFL era (1990 onwards) only two teams other than the 2016 Dockers have experienced a year-on-year decline of 40 percentage points or more: the 2008 Eagles and 2002 Blues. Those two teams had very different paths over the next few years. They both remained losing teams in the two years after their decline – 2009 and 2010 for the Eagles, 2003 and 2004 for the Blues. 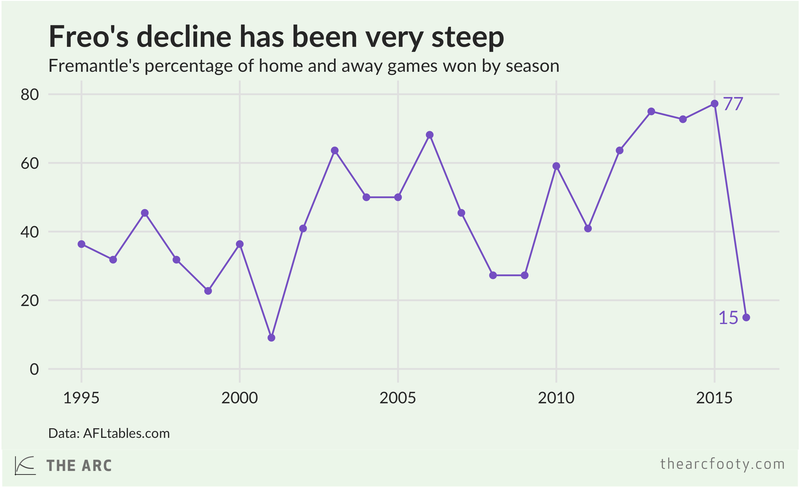 But in the third year after their decline (2011), the Eagles came good again, experiencing the largest single-season improvement in VFL/AFL history, while the 2005 Blues won only four games (18%). The Blues haven’t finished in the top four since 2000, while the Eagles played in a Grand Final last year. Time will tell which of these paths the Dockers will follow.